A toy drive in memory of Brandon Cundiff is now in its fifth year, with the toys going to patients on the cancer floor of Nationwide Children’s Hospital in Columbus. Brandon passed away at the age of 18 from leukemia. 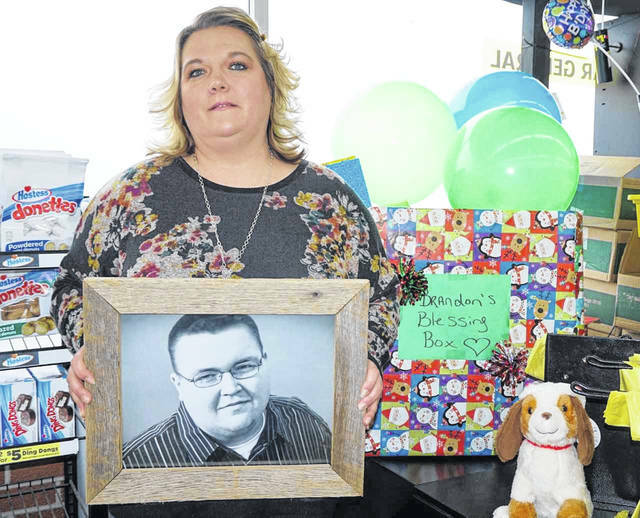 His mother, Angel Darst, is shown with a photo of Brandon next to a collection box at Dollar General Store in New Haven. BEND AREA — Before Angel Darst’s son, Brandon Cundiff, died in 2014, he asked her to promise him two things: one, not to be mad at God so they could someday be reunited; and two, to keep his name alive. Darst has kept her promises. For the fifth year, she will not only keep Brandon’s memory alive, but also will put a smile on the faces of many other children who are battling the disease that her son so courageously fought. For the past four year, Darst has returned to Nationwide Children’s Hospital in Columbus, taking with her toys that she collects in Brandon’s name. Brandon was diagnosed with leukemia in April 2012. He spent a lot of time at the children’s hospital undergoing treatment, and things were looking up for him for a while. But just one year later, April 2013, his cancer returned. Then one more year, April 2014, Brandon passed away at the young age of 18. Brandon never gave up hope, even in his final days, according to his mother. His dream was to become a nurse anesthetist and work on the cancer floor at children’s hospital, where the nurses had helped him so much. So when Darst was mulling a way to memorialize her son, the thought of doing for others came natural. She collects toys at Christmas to brighten the faces of the children on the 12th floor, the cancer floor, who are hospitalized over the holiday. Darst admits it is not easy to return to the hospital where her son spent so much of his final two years, but vows that as long as she is healthy enough to do so, she will return with toys for the children. “If a stuffed animal brings a smile to one child’s face, it is worth it,” she said. Toys are being collected at Dollar General Store in New Haven and Fast-4-U in Mason. Both joined Darst’s efforts three years ago. And, for the first time, the New Haven Elementary School Student Council is coordinating a drive there to collect coloring books, crayons, colored pencils, playing cards, board games, and puzzles to assist Darst. In addition to the toy drive, Darst holds a bake sale each year in front of Walmart. She said she uses the money raised to buy gifts the older kids and teenagers like. Darst added the 12- to 18-year-olds love gift cards, such as I-Tunes and Google Play. The cards allow them to listen to their favorite music or play games on their electronic devices. Subway and McDonald’s cards are also favorites, with the restaurants being accessible to the teens. Darst said she has a great helper next to her – her 10-year-old daughter Linzie. Linzie accompanies her mom to the hospital to deliver the toys to the social worker. The two are not allowed on the cancer floor themselves, for fear of taking the children a virus or other sickness. Darst said on occasion, Brandon’s doctors will also meet and speak with them while they are there. Brandon was always giving rather than receiving, according to his mom. She describes her son as easy going, the class clown. He was voted prom king his senior year at Wahama High School, and while he wasn’t there to accept the honor because he was in the hospital, his classmates set up a video chat from the prom. Brandon’s memory is not only kept alive in Columbus, however. Darst gives out scholarships to graduating seniors at Wahama each year, as well. This past May, she presented two $500 and a $300 scholarship. Darst and Linzie will be delivering toys to Columbus on Dec. 14. Anyone wishing to donate can take their items to Fast-4-U, Dollar General Store, or New Haven Elementary School by Dec. 13.